Gillian Welch’s “April the 14th Part 1”: The greatest rock song ever written – Here is Ira Brooker. A while back I went to see Outer Minds play at Turf Club. Not only does the band specialize in the kind of dark, dangerous psychedelia that I thrive on, singer/organist Mary McKane and drummer Brian Costello are friends of mine from Columbia College Chicago. The band’s Saint Paul gig was the first stop on a three-week tour of the West, undertaken the old-fashioned way, in a questionably reliable van (they’d already encountered their first automotive trouble driving from Chicago to Saint Paul). Chatting with Mary before the show, I mentioned how impressed I was with their commitment. She shrugged and said that between this, her writing and her other band, she was at least keeping herself from having to get a day job. I was instantly flooded with an admiration bordering on the profound. bursts of drugged-out inspiration, but I’ve always been more drawn to the grungy aesthetic of the barely-making-it band. That’s why I hold Gillian Welch’s “April the 14th Part 1” as the greatest song ever written about rock and roll. There are plenty of songs about wanting to be a rock icon, ranging from celebratory anthems of aspiration (Prince’s “Baby I’m a Star,” Dr. Hook’s “Cover of the Rolling Stone”) to cynical tales of caution (The Byrds’ “So You Wanna Be a Rock & Roll Star?”, The Smiths’ “Paint a Vulgar Picture”). With “April the 14th,” though, Welch treads considerably more grounded ground. At this point, the musicians aren’t just grim and hopeless figures, they come off almost like alien beings. Welch dispassionately discards all the usual touchstones of rock stardom. Fame is off the table – none of the papers can be bothered to cover the show. Money is even less of a motivator – unless the song takes place within half a tank’s drive from the Idaho border, the band will be dipping into its own funds just to get home, let alone to the next tour stop. Even basic human comforts seem to be out of reach – they’re visibly sickly and literally sleeping in their own filth. That line is, to me, what makes “April the 14th Part 1” the greatest song about rock – and maybe even art in general – ever written. There’s a line my old pastor used to be quite fond of throwing at us youth group kids: “True love is not because of; true love is in spite of.” I’m tempted to apply that here. You could argue that Welch is looking past all of the external ugliness of the band’s situation and seeing the beauty of being a touring band. But even that makes it too easy. I think she’s looking at the squalor and poverty and futility of this unnamed Idaho ensemble and falling in love because of all that. The rest of the song is likewise packed with grim beauty, describing the mundane clean-up process after a show (“Threw the plastic cups into plastic bags / And the cooks cleaned the kitchen with the staggers and the jags”) and cryptically referencing three tragedies that took place on the titular April 14th (the sinking of the Titanic, the Dust Bowl’s Black Sunday and the Lincoln assassination). It’s all bleak and poignant and just as enticing to me as it is to Welch. Take this blog post, for instance. Who’s going to read this? Maybe a couple dozen people who follow me on Facebook and Twitter. A lot of folks would say (and have said) there’s no real reason to spend my time and mental energy writing something that’s going to have such a miniscule reach. I suppose they’d be right, but I’m not writing this in hopes of reaching a huge audience. Sure, I’d be thrilled if this or any of my writings went viral and I became the toast of online artistic circles and got invited to write an op-ed column for Slate and saw myself pilloried on anti-arts message boards. But that’s not why I do it. I do it because these ideas are in my head and I need to put them down in writing. Not only do I need to do it, I love to do it. Most of my writing is done late at night, huddled in a chilly basement, racing to get something coherent written down before the accursed necessity of sleep becomes too overbearing to fight. It’s not glamorous, it’s not fun and there’s seldom any kind of financial reward waiting at the end of my word count, but my god, do I look forward to putting on some records, hunching over my laptop and driving myself half-crazy obsessing over conjunctions. I won’t go so far as to say the writing is its own reward – I always write in the hopes that somebody is going to read it eventually – but if I was only in it for the glory I’d have given up a long time ago. 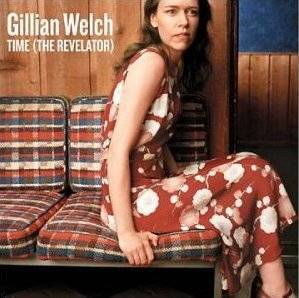 That’s the beauty of “April the 14th Part 1.” Better than anyone else I’ve heard, Gillian Welch captures the artistic drive to get out there and make something, to share your creation with whatever miniscule sliver of the world you can coerce into glancing at it. Even if the experience is awful and ugly, it’s still your art and it’s what you have to do. My hat is off to Mary and Brian and Gillian and all the other creators who can face up to the harsh realities of an artistic existence and say, “That’s what I want!” The world needs more of that.